De Pilsvogel is located in the trendy district de Pijp. It’s surrounded by many other bars and restaurants. This bar is well known by locals, the reason for their success is the variety of products they offer. Next to the regular drinks, they offer many kinds of finger food and also proper meals. So you actually have the whole range in one bar. During the summer they have a nice terrace where you can have drinks until closing time (2AM). The prices of the drinks are normal (beer €2,50 wine €3), the (finger)food is relatively expensive for a bar/eatery. Main course is approximately € 20,- and small portion finger food is € 10,-. The only comment about this place is the staff, unfortunately this applies for a lot of bars in Amsterdam. Young students do the best they can, but service and politeness can’t be guaranteed. 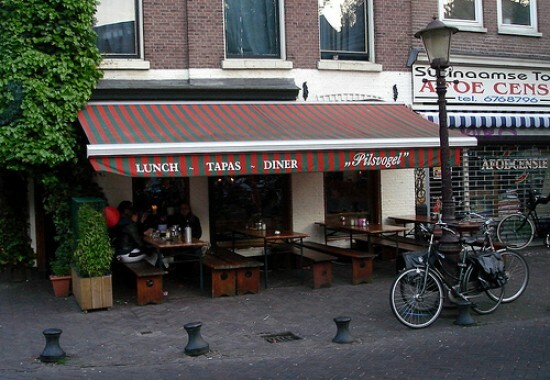 Next to that, de Pilsvogel is a typical Dutch bar for urban youngsters. Go and check it out!